Most people would agree that art has a spiritual aspect. The spiritual aspect of art was recognized in the origin of copyright law in the French Revolution, which declared that the spirit of the art (droit morale) has rights. Art can serve the public good and cultural aspirations of a community. The genre of ecological art straddles definitions of moral, spiritual, and earth rights. In our times, public good is increasingly defined as the assertion of earth rights, in which clean water plays a crucial role for all life on the planet, but which can conflict with corporate interests. Ecological art reflects a vision of public good that aligns aesthetics and ecosystem knowledge. The future of international water systems is inextricably linked to our present responses to climate change. Global warming threatens international water supplies. When the essential need for abundant, clean water is denied, the public good of civilization is breached. Global warming is the international vector determining the distribution of climates, manifesting as drought or floods, chasing species into extinction, and politically destabilizing whole regions of the earth. There has not been a concerted, strategic response to this problem, although the United Nations’ Intergovernmental Panel (IPCC) on Climate Change has struggled to integrate the science and politics of such a strategy. Absent such a strategy, saltwater intrusions from sea level rising, melting glaciers, and creeping desertification, make solving water-related problems difficult. This is a systemic challenge in which culture is one more system, where ecological artmaking can play a substantial role. In the genre of ecological art, understanding how systems work is an essential studio tool. Learned and applied systems are as relevant to art as they are to engineering. Until recently, many artists concerned about environmental problems assumed the best outcome their work might strive for would be to sensitize and educate audiences. Contemporary ecological artists challenge the presumption that science has no place in serious artmaking or that policy change is beyond art’s purview. Both science and policy are central to the practice of ecological art. That concern is central in my own practice. Early in 2015, a small group of anti-fracking activists sought out an artist who might apply the example of Alberta sculptor Peter Von Teisenhausen who used copyright law to drive off natural gas pipeline corporations who sought to cross his ranch. [3, 4] Von Teisenhausen proclaimed his entire ranch was copyrighted and untouchable. I responded by developing a project to lie in the corridors of proposed natural gas pipeline expansions, offering an aerial conception of pipelines as musical lines in an intercontinental symphony. What was eventually copyrighted, was a distribution of “tree-notes,” that comprised the overture and measures of the first movement. 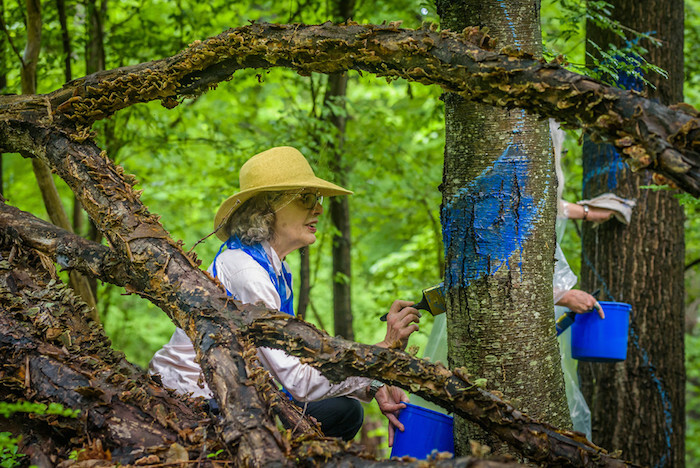 Each tree-note was identified with a vertical sine wave made of ultramarine non-toxic blue pigment and buttermilk to grow moss on the tree trunks. As of this writing, the overture has been performed in Peekskill, New York, where the Spectra Corporation is laying 42-inch-wide pipelines for volatile fracked gas only 105 feet from an ageing nuclear facility (Indian Point), thirty miles from New York City. Across the Eastern United States, several miles of these measures have been mapped and copyrighted. A legal framework has been created that argues a relationship between copyright and eminent domain law in the creation of ecological art. The roots of these trees protects the soil, which knits the ecosystem to preserve rainfall, which creates the watershed for the public good. The location of the overture for this project was opportunistic, when a landowner requested help. However, it was also a good example of the focus of my PhD dissertation, “Trigger Point Theory as Aesthetic Activism,” because the confluence of circumstances promised that the site would be a paradigm for the conflict between unfettered fossil-fuel-based economies and developing systems, which present an opportunity to replace exploitative with sustainable behaviors. Preserving clean water has always been important, but effecting that preservation, despite political resistance, has often taken a circuitous path for me. In my own work, I applied layered systems to determine watershed sustainability in the age of climate change. We cannot preserve watersheds and groundwater without preserving the habitat surrounding them. Habitat cannot be preserved without considering the values endangering it. Those values often depend on profound cultural assumptions. In the IPCC mandate, economic and cultural values co-exist with parity. But where is the catalyst to change those values? I decided the catalyst lay in the judicial system, activated by art. In The Blued Trees Symphony (2015 – present), I asked myself how to stop climate change. I decided the task was to stop using fossil fuels and create a legal basis grounded in earth rights case law for arresting that use. The agents that create culture may be grounded in short-term economic interests, such as those that continue to support fossil fuel proliferation. Culture-creating agents may also grow out of long-term observations of how resilience may be maintained, as is seen in many indigenous cultures, many of whom are disproportionately affected by climate change and fossil fuel extractions. Indigenous societies often weave the production of beautiful artifacts and customs into natural observations of where grasses grow, which trees might be used by particular species of birds, or how predators stabilize ecosystems. Holistic indigenous habitat conservation methods inspired The Blued Trees Symphony, with cultural aspirations for beauty in mind. The problem with the pursuit of abundant clean water for life on earth is that, like the pursuit of happiness, a linear relationship is not always the most efficient path to the desired outcome. The path I envision requires a set of complex relationships between humans and nature. We must accept limits on conventional human expansionism and the assumption of entitlement to the world’s resources and recognize the needs of the ecosystems upon which human life depends. We cannot realistically build fences around water systems, particularly in times of migrating climates, as encroachment and drawdown accelerates, and expect to preserve adequate water for cities, agriculture, and industry. We can, however, establish a different relationship to the systems that preserve the public good. Earth rights is the premise that the planet is a living entity in which other species not only have agency, but that their rights to survive conflate with the survival of the human species. Geographic Information Systems science maps layers of disparate data to algorithmically explore and analyze relationships for predictive models. Ian McHarg, credited as the Father of modern landscape architecture, analyzed the same patterns in layers of freehand drawings, incidentally demonstrating how art can be an analytic tool as powerful as algorithms. McHarg used his methodology to design sustainable communities by taking landscape features into account while proposing aesthetic and economical infrastructures. His approach inspired me to envision how a deeper application would permit people to build communities that are also biologically integrated with habitat at the biogeographic scale. In the United States, the Visual Artists Rights Act (VARA) protects the rights of artists to preserve their work. “Blued Trees Overture" by Minister Erik McGregor, 2105. Aviva Rahmani holds a PhD from Plymouth University, UK in environmental sciences, technology and studio art and is an Affiliate at the Institute for Arctic and Alpine Research (INSTAAR), UCB. She exhibits and publishes internationally and was awarded a 2016 New York Foundation for the Arts (NYFA) Fellowship for her project, The Blued Tree Symphony, an aspect of Gulf to Gulf (2009- present), a NYFA sponsored project on changing climate change policy with art.